Her Aunt May and Uncle Ben! Why is Linda's last name Brown? Why did Uncle Ben go from a gray-haired, mustached thin guy to a white-haired shaven fat guy? If Ben and May took care of Peter for his entire life, how far back is this story? Is Peter actually here, and we just don't see him? Why are the Parkers living by the beach? When will Dan Slott and Ty Templeton tell the story of Peter Parker meeting his mermaid cousin? Have at it, folks! The more creative the answers, the better. Winner gets a cookie. Continuity nuts who can't appreciate humor and want to answer with "This isn't really Aunt May and Uncle Ben, you idiot," don't get anything. In the meantime, this story and a lot of other Ditko goodies can be found in MARVEL VISIONARIES: STEVE DITKO ! I think it's the younger Ben and May. 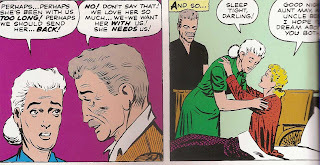 There is this missing link from Aunt May's lines. Amazing Spiderman #238. Can't figured it out. Hmmm. Details, friends, I need details! Wow, I didn't know about this wonderful back-story of Marvel history. I will TOTALLY bring this to Dan's attention. In the words of Sergeant Fury, WAHOO! Do it, Ty, do it! It's probably just the Clone of Uncle Ben and Aunt May created by the Jackal. That's why Ben has put on that sweatshirt in the second panel. Yeah, that's it.